Eating well, and cheaply, is a not a difficult feat here in Xi’an. However, as much as your wallet may appreciate the savings, every once in a while you need to put down the liangpi, roujimo, and bingfeng and get a taste of food from outside the Middle Kingdom. 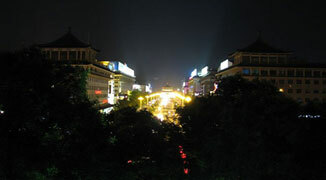 While Xi’an’s list of cultural cuisines is growing, it can be difficult to find good foreign restaurants. To help ease your search, here are a couple suggestions. The number of options available on the menu at Delhi Darbar may overwhelm some people, but be assured, even if you were to pick dishes at random, you’d be happy with the outcome. There are a wide variety of different masalas along with other Northern India specialties at reasonable prices, and generously enough, they have an English menu. The restaurant itself is very cozy and colorful, and to help with the ambience there is also a constant stream of Bollywood music videos playing. As anyone who has had the chance to see some of these videos may agree, if that isn’t a conversation starter for whomever you are with, nothing is. Getting there: Take bus No. 26, 27, 408, 503, 527, 710, 720, 722 or 933 to Yanta Xilu (雁塔西路) stop. The restaurant is on the west side of Dayanta (the Wild Goose Pagoda). Standing with Dayanta behind you, Delhi Darbar will be the first restaurant across the street and to your right. Bierhaus is a treat for special occasions, if only because you can rack up quite a bill if you’re not paying attention. They have everything from pastas and salads, to your classical German sausages and beer. One of their specialties is a giant glass boot of beer that will make your mouth water after weeks of drinking only Hans and other cheap beers from around the city. Getting there: Take bus No. 5, 19, 21, 22, 23, 24, 30, 34, 41, 44, 224, 237, 408, 501, 521, 526, 527, 601, 619, 715, 933, k606, k609 to Yanta Xilu Dongkou (雁塔西路东口) stop. Beirhaus is across the street from Delhi Darbar (above). Mexico, though only recently opened, is well on its way to becoming a popular local spot. They’ve got a good selection of tacos, burritos and two choices of imported beers from its namesake. More impressively, they have a wonderful selection of different tequilas and have specials throughout the week. As the sun goes down, Mexico transitions into a nice bar scene complete with a DJ; if you feel like dancing after you’re done with your meal there are also a few new clubs just down the road farther into the park. Getting there: Take bus No. 10, 18, 21, 43, 107, 206, 224, 262, 504, 506, 509, 722, 900 or k205 to Shuisi (水司) stop. If you are a sucker for rotating sushi bars, you will be bouncing off the walls with excitement when you first see Wo Green Sushi. Thankfully, their sushi lives up to expectations. Naturally, you can’t compare it to sushi from Japan or cities near beach fronts, seeing as Xi’an is very much landlocked, but it will more than satisfy your craving. There are nine different colors of plates ranging from 6 RMB to 33 RMB each. They also have a menu, which you can order more hearty dishes from. Getting there: Take Subway Line 2 to Xhaozhai and leave via Exit C. Cross over the intersection and head to the giant blue and yellow reflective looking mall. One of the best things about Qing Mai Thai, aside from the food, is the decor. You feel like you’ve walked into a different world when you enter its gated entrance, a Thai world. The food itself can have quite a kick so if you’re not a fan of spicy curries make sure to specify that when you place your order. Getting there: Take Subway Line 2 to Tiyuchang station and leave via exit B, walk straight for a couple feet before turning right onto the first street. Stay on this street for about 15 minutes until you see a large green Vanguard sign on your left. Cross the street to enter the shopping mall.